Tahupōtiki Wiremu Rātana brought together the dispossessed remnant of many Māori tribes and inspired them with his religion – and his politics. He challenged the New Zealand prime minister and the British Crown to honour the Treaty of Waitangi. The church he founded had thousands of followers in the early 21st century, including many in Australia. Tahupōtiki Wiremu Rātana was born in 1873 at Te Kawau, near Bulls. After he finished school, he worked on his family’s farm. In 1918 his son Ōmeka became very ill. Rātana fasted and prayed. He had a vision that he should unite his people and free them from old superstitions. His son recovered, and Rātana’s reputation as a healer began to spread. 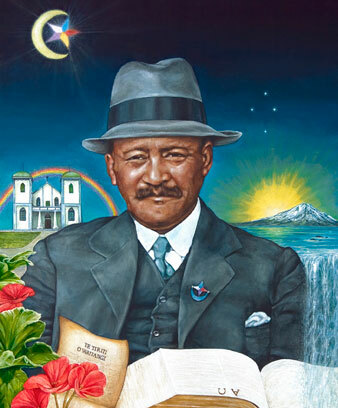 His farm near Whanganui became a small town as people flocked to hear his teachings and seek healing. It became known as Rātana Pā. At first Rātana encouraged people to continue attending their own Christian churches, but differences of beliefs led Rātana to establish his own church in 1925 – Te Haahi Rātana, the Rātana Church. In 1924 Rātana took a group to London with a petition signed by thousands of Māori to present to King George V. They wanted redress for land confiscations and breaches of the Treaty of Waitangi. The New Zealand government managed to prevent the meeting. In 1935 Eruera Tirikātene became the first Rātana Member of Parliament, and in 1935 Rātana’s son Tokouru also became an MP. They were both members of the Labour party. In 1936 the Rātana Church pledged itself to support the party, and in return the party supported Rātana candidates for the Māori seats in Parliament. By 1943 all four Māori seats were held by Rātana MPs. Rātana members held the seats for the next 50 years. In 1928 Te Temepara Tapu o Ihoa (the holy temple of Jehovah) was opened at Rātana Pā by a Japanese bishop, Juji Nakada. By then Rātana had around 20,000 followers. They were called ‘ngā mōrehu’ (the scattered remnant) and came from many different tribes. As well as the Bible, the Blue Book was used in church services. It contained prayers and hymns written in Māori, many composed by Rātana. The main symbol of the church was a five-pointed star with a crescent moon, representing God and the angels. In 2013 the church had 40,353 members in 127 parishes, as well as several thousand members in Australia. Every January thousands of people gather at Rātana Pā to celebrate Rātana’s birthday. There are brass bands, and church officials wear gold, purple and white garments. Politicians also attend the event.